EDITOR’S NOTE: (Dec. 14, 2017) Test & Measurement World was merged into http://www.edn.com some years later. I’ve updated the links for you. T&M World has asked me to increase the frequency of postings from 1/week to 2/week. Apparently, the postings are receiving lots of “clicks” from the readership, so they want more. Unfortunately, I couldn’t quite keep up with the blog here, so once the series was completed earlier this week, I thought I’d get back over here and provide the links to the complete troubleshooting kit postings. I just completed the last installment of the blog series on the EMC troubleshooting kit I’ve been using for several years. I’m hoping it will be of interest and that it might inspire you to start assembling your own kit. While a bit expensive if you purchase one of the better spectrum analyzers, I found it’s paid for itself several times over through the years. 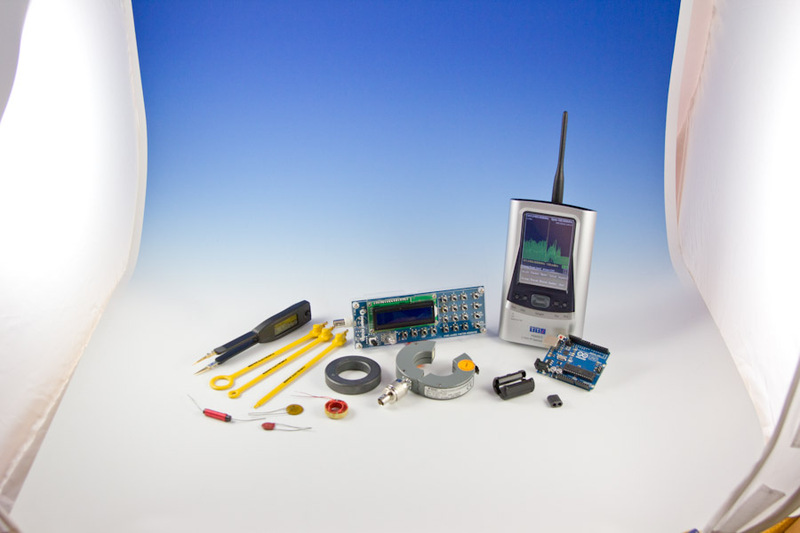 This last installment discusses some low-cost spectrum analyzer options and includes a complete listing of all the tools, components and troubleshooting gizmos. I haven’t really addressed most of the immunity testing (besides ESD), because that generally requires pretty sophisticated gear. We’ve been receiving a lot of positive comment and I’d love to hear other suggestions of tools and accessories you’ve used – especially for simple-to-use and low-cost immunity testing, but I’d appreciate your posting your thoughts on the blog entires themselves. This is a continuation of a description of my EMC troubleshooting kit as posted in the Test & Measurement “EMC Blog”. In the next few installments there, I’ll describe a few of the tools I use to test immunity of a prototype product to various stimuli. Bear in mind, immunity testing is a lot tougher to perform on the bench, so not all tests will be accommodated. To really ensure immunity levels, the product under test will have to be taken to a test lab. So, what tests can be performed easily at the bench? These would include ESD, radiated immunity and certain pulse phenomenon. Of all the immunity tests, my experience has been that ESD and radiated immunity tests are the most likely to fail. 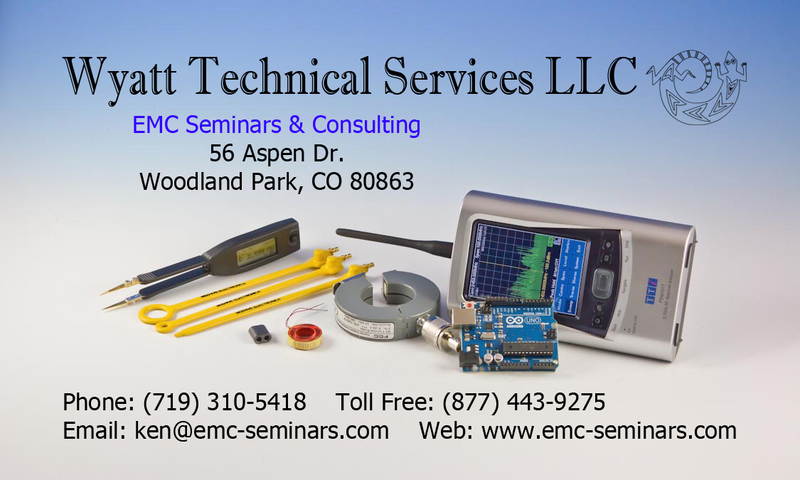 In this installment, we’ll discuss one method to assess your circuitry or product against ESD phenomenon. There are several more ideas in The EMC Blog. While you can’t beat an actual ESD simulator for pre-compliance testing, there are a number of simple ESD generators that will work well to at least give you a general feel for whether your circuitry is immune. One simple DIY ESD generator includes this BBQ grill igniter. You can purchase a replacement kit for a few dollars and the included wiring makes a good loop antenna. Holding this near your circuit board or close to the I/O and input ports to your product can indicate quickly if there are ESD issues. I’ve measured several volts into a simple UHF dipole antenna connected to an oscilloscope input. Edge speeds can be in the 50 to 200 ps range. A simple piezoelectric BBQ starter is the heart of this ESD generator and can create large fields with 50 to 200 ps edges. The included wire makes a good loop antenna. My EMC troubleshooting kit is packed into a Pelican 1510 roller case. 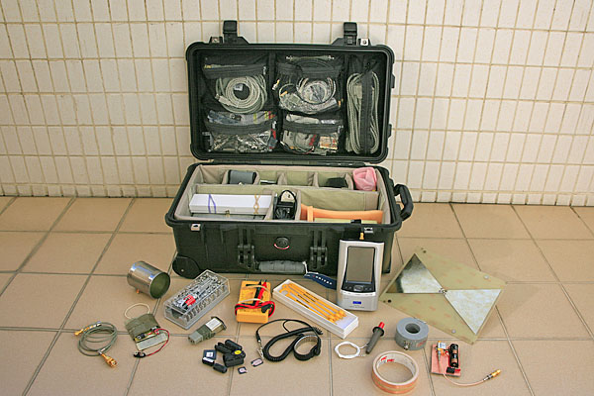 Contents include a spectrum analyzer and various probes. 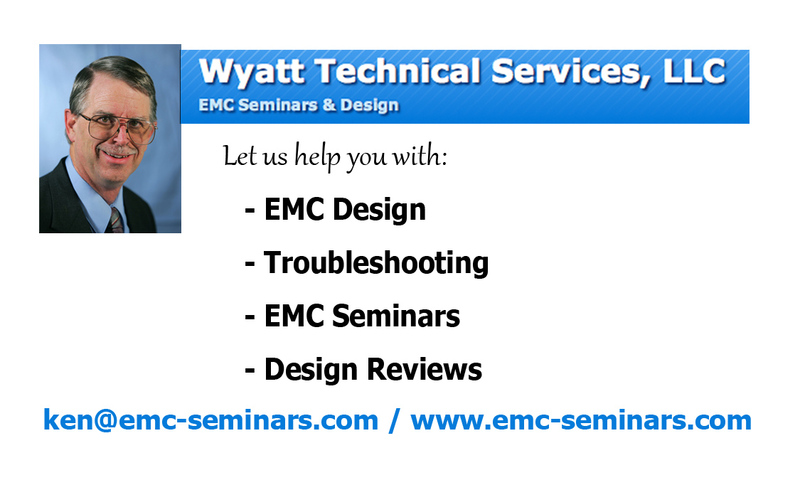 I’m currently describing the contents of my EMC troubleshooting kit in the Test & Measurement World EMC Blog. The first two postings (Part 1a and 1b) include detailed descriptions of the tools and accessaries I use for radiated emissions. The future postings will include a description of some tools used to assess radiated immunity and ESD. The kit is useful for limited pre-compliance testing, but it’s most useful for assessing radiated emissions. The kit also includes the usual range of resistors, capacitors, inductors, ferrites, copper and insulated tape and antennas. Somewhat off-topic, I know…but I needed to make up new business cards and I thought I’d describe the process I used to create customized ones. While I used the full-blown Adobe Photoshop, it is possible to use the much less expensive Photoshop Elements, or similar, that will allow you to text to a background image. The front of the final card design. By grouping the subject all across the center, I was able to fit in the text above and below. Be sure any text is well inside the “bleed” zone (extra 1/8-inch border, which gets trimmed off). Because I wanted to make the background completely custom, I photographed a few commonly-used tools for EMC troubleshooting (see, there IS a connection to EMC!). In order to make the resulting image “professional” looking, I placed the objects into a “light tent” and used daylight-balanced CFL lamps placed on each side of the tent. The tent serves as a light diffuser, which softens the light and reduces shadows. I also used a seamless background – mine being blue at the top and transitioning to white on the bottom. The rear design of the final card. I like to include my portrait (make sure you’re smiling! ), along with the services I provide and email/web. While the setup described can be purchased, it’s possible to cobble your own together out of ordinary parts found in most hardware stores. I certainly wouldn’t buy this setup new just to take a picture for your business card! Let me describe the homemade setup. Start by purchasing about a yard of white nylon translucent fabric at a material store. You’ll drape this over the top, rear and both sides of the tent frame, which is created using white plastic PVC water pipe. With the right type of corner couplings, you’ll end up with three-sided framework (left, right and rear) about three feet on a side. The fabric will serve as a diffuser. Purchase two reflector-style utility lamp fixtures (usually comes with line cord attached) and buy some daylight balanced (5000K) CFL screw-in lamps. These may be used as general utility lighting later. Set up the framework and fabric on your dining room table and place the lamps just outside the framework on each side. This will be you light source for the subject. Next, take some wide craft paper (white, or most any pastel color, from a hobby or art supply store) – maybe three 2-3 feet wide by three feet long and attach the corners at the top of the rear side, so the paper drapes in a wide curve from upper rear to lower front as you’re attending facing the setup. This will serve as your seamless background, hiding most of the framework. One try at a subject, but the spectrum analyzer was too tall to fit the text in, so I had to lay it over and remove several items. I show this photo, because it shows the seamless background and part of the diffusion tent. Adjust the lights to reduce shadows. You may have to prop them up on boxes to get them higher. Place your subject items at the bottom (towards the middle) of the paper backdrop and photograph it, taking care to leave out the sides and any framework showing. You may have to stand back a ways and use your telephoto to zoom in a bit. Turn off your built in flash, as the side lamps should provide all the light required. Make sure your camera ISO is set high enough so the shutter speed is 1/100th second, or faster, for the sharpest image. Load the final image into your favorite editing software and make any adjustments to the subject you wish. Crop to 2.25″ high by 3.75″ wide by 300 dpi (business card size with about 1/8-inch “bleed” all around the edge. This bleed area will be trimmed off during the production. Be sure there’s no text within or close to the bleed zone. Add your desired text all around the background image, keeping in mind that good business card designs have most of the contact info in a single place – not all around the edges. After all, you want the viewer’s eyes to go right to the info and not have to search all around for it! I usually create a double-sided card with my portrait on the back with my services provided, but leaving some “white space” for written notes. I feel the portrait is important, because most people recall “visual”cues, rather than text (names). I also use a gloss coating on the front and leave the back matte, so notes may be easily added. The final step is to convert the background image with text to JPEG files (one for the front and one for the rear) and turn the files (or upload) to your nearest print shop!